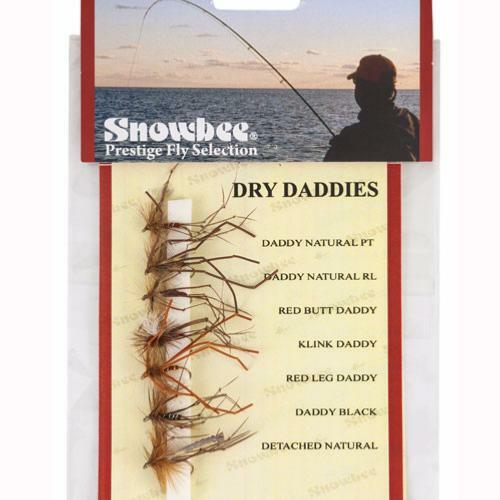 Snowbee Dry Daddy Fly Selection, 7 Flies. Daddy Long Legs / Crane Flies, one of the most exciting flies to fish with. Trout go mad for them on rivers, lakes or reservoirs. Use them as a point fly, or on their own. A huge mouthful to the trout, they are in abundance in the Autumn (albeit they are a great fly year round), they are often blown onto the water surface where your prey will quickly respond - Drop them on top of any obvious trout activity, or cast near the bank, under trees etc. 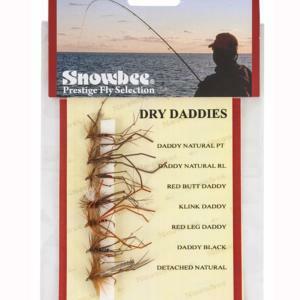 If you prefer Snowbee Gold Head Daddies, follow this link, Snowbee Gold Head Daddy Fly Selection. Nice but a bit squashed.